You’re probably protecting your skin from the sun but what about protecting your hair? Many people don’t know about the hazardous symptoms of sun damage to the hair. Sun damage can cause extreme color and texture change, not to mention uncontrollable frizz and split ends. Why not avoid this and care for your hair the right way. Stock up on products that provide Ultra Violet (UV) protection ASAP! Start in the shower with Redken Color Extend Shampoo and Conditioner helps contain your vibrant color and even gives a shiny glow. This product’s powerful UV filter provides extreme protection while restoring lost moisture and shine. Prep your hair with UV protecting styling products. It’s a 10 is always one of our most popular brands. The Miracle Leave-in for Blondes tones hair color, enhances vibrancy, and serves as a detangler. This leave in serves as a great thermal protector that defrizzes hair from humidity. The Miracle Blow Dry Volumizer gives your hair eruptive volume, resists humidity, and has a strong hold. Both of these products provide excellent UV protection. Finish and hold your style with Paul Mitchell styling products that help shield your hair from the damaging effects of the sun. Freeze and Shine Super Spray provides a firm hold and adds a high shine finish. Soft Spray helps control your strands and is easy to restyle by activating with water or heat. Fast Drying Sculpting Spray adds voluminous texture to your hair which is ideal for up-swept styles. Men, this one’s for you! American Crew Medium Hold Spray Gel works well with either damp or dry hair. This formula is great for blow drying any type of hair lengths and provides good flexibility. It's alcohol free and helps protect hair from UV damage. You’re now ready to have fun in the sun! 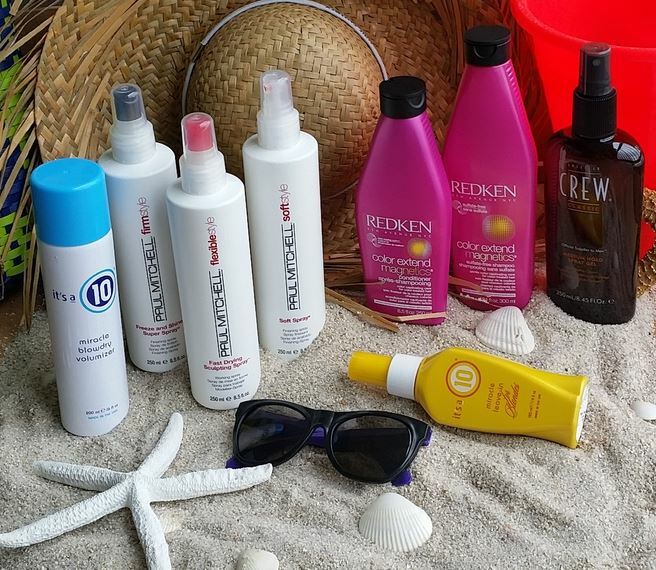 Come into your Hair Cuttery to find all the summer essential products to keep your hair healthy this summer.